These were photographed from the back in order to show off the one thing that differentiates these from production figures, the lack of copyright lettering and dates on the backs of the legs. After the molds were determined to be ready for production, the lettering was added. These types of figures were among some of the very first to be injection molded and painted. 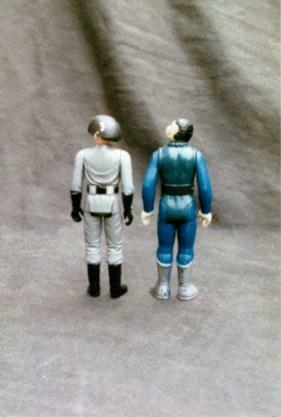 They were most likely samples sent back to Kenner from the Orient and these two were no different as they originated from a Kenner source. There is a lot of paint wear on the heads of these figures. That paint seems to be thicker than production paint therefore it's almost soft and pliable. This makes it peel off rather easily. The DS Commander was partially handpainted because the insignia on the chest was not done by a machine. A brown button was also painted at the collar. This button is not present on production figures.